An interesting but malevolent and gloomy drama about a bestselling writer with writer's block who enlists her assistant as ghost writer, only to find the assistant's talent is eclipsing hers, and people are beginning to notice a shift in "her" style. The initial dynamic of a former master deteriorated to mediocrity vs. the emerging excellence of the amateur upon whom she depends is short-circuited via an eventual series of compromises on principle in the final episodes. Interesting for its immersion in the world of Japanese fiction publishing and definitely worth a look, but with caveats. Currently available on Crunchyroll. The main storyline between Nakatani, Mizukawa, and Tanaka was very good. But there were some subplots involving Nakatani's mother, her son, and her secretary that were more of a distraction than anything else. 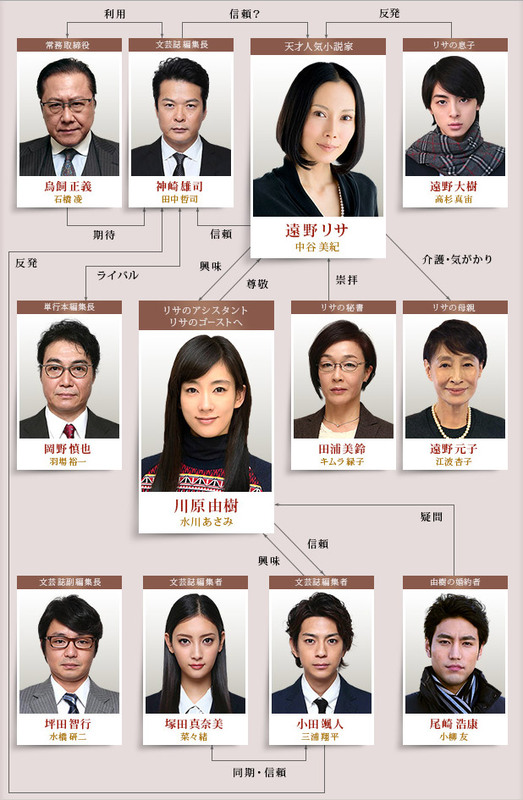 Good work by the main three actors and also Shohei Miura in a supporting role.